Alzheimer's dementia or other dementia causes changes in mood, judgement, personality, and makes it difficult to communicate or cope with day to day tasks. It usually gets worse over time, which means that you have to rely on other people more and more. Dementia can rarely start as early as 40. It is estimated that about one in every 20 people over-65 have dementia. By the age of 80 about one in five are affected. 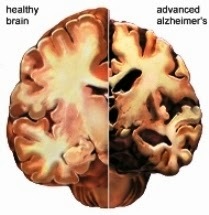 Alzheimer’s disease is the most common dementia. Damaged tissue builds up in the brain and forms deposits called ‘plaques’ and ‘tangles’ which cause the cells around them to die. It also affects chemicals in the brain which transmit messages from one cell to another. Lewy body dementia is caused by small protein deposits in the brain, and symptoms closely resembles Parkinson’s disease. Fronto-temporal dementia is caused by damage to the front of the brain and is more likely to cause personality change. • Kidney, liver or thyroid problems. • Shortage of some vitamins (although this is rare). • Chest or urine infections can lead to confusion and can be treated with antibiotics. • Rarer conditions such as Huntington’s disease, which causes dementia in younger people. • Depression can cause a “pseudo-dementia” which can get better with antidepressants and talking therapy. Functional problems - it gets hard to do complicated tasks. As time goes on, it gets harder to do the basic task of looking after yourself, like washing and dressing. Emotional problems - your mood can change, you may lose control of your emotions, stop doing things that you enjoy and stop seeing people. There are no cures, as yet, for many of these conditions and treatment depends on the diagnosis. A group of drugs called acetyl cholinesterase inhibitors may slow the progression of Alzheimer’s dementia and Lewy Body dementia and another drug called memantine, a glutamate blocker, may protect brain cells against damage. In Vascular dementia and possibly Alzheimer’s, other drugs may be of use in slowing the damage to brain cells and hence brain function, including: Aspirin, Medication to control high blood pressure, Cholesterol lowering treatments such as statins. There is a small amount of evidence that the herb gingko biloba and possibly also vitamin E may help delay progression of the disease It’s also important to stop smoking, eat healthily and take exercise. Discuss any concerns you have with your doctor, mental health nurse or social worker. Charities such as the Alzheimer’s Society are also a very useful source of advice. They can help you understand more about the illness with advice about medication, care options, benefits and legal issues.